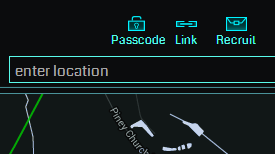 The Intel map has gone back and forth between having Passcode redeems and not. Last time redeem was enabled was back in February of 2013. However, it was quite boring with the text only appearing in the bottom right corner. Things have changed this time around. We have noticed this feature only on the desktop version of Intel, the mobile version doesn’t appear to have support for Passcodes yet. Top right hand corner will feature the “Passcode” button. Unfortunately, shields and mods do not show their rarity. Is this a temporary fix for iOS users unable to submit passcodes? Or a change here to stay.